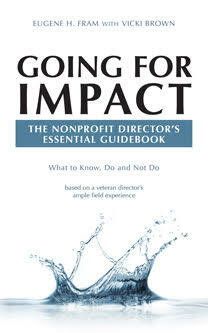 Does the Nonprofit CEO Need to Go?? Recognizing and acknowledging that the current CEO is no longer helpful to the nonprofit organization is never easy to come by. Beyond malfeasance and under-performance, obvious reasons for initiating such a discussion, there are often other indicators: his/her modest leadership skills, ineffective discussions between the CEO and the board chair, criticism from external stakeholders, overemphasis on tactics unbalanced by a focus on strategies, etc. Volunteer directors are loathe to be confrontational when a CEO has been marginally satisfactory for a number of years, preferring to avoid the “drama” that inevitably accompanies the “changing of the guard.” Yet this type of change can’t be accomplished in a clear and pristine manner. Some CEO’s fly under the radar. They talk a good story to their Board but the Board never really hears the full truth of what is actually going on in the organization. If they talked to the front line workers or even Managers that report to the CEO they might understand just how little they are being told and just how slanted the information they receive actually is. They often talk down to their staff, cuts them off when they are speaking, embarrasses them, take their ideas as their own and think of themselves as a real leader. The Board sees the side they present not the real person they are. They make cuts and increase staff in areas that make no sense to anyone but them. They do not listen, as they know everything- at least in their minds. They hire their friends and do not declare conflicts. The Board sees or hears none of this. If they did I expect they would not remain in “power”. I am sure this happens more often then you think. Too bad the Board does not see them as they really are… Maybe the idea of 360 PA’s for CEO’s might work but you best be sure the info is kept confidential or working with these types would be even worse than it is. Maria Yes. I agree. However, I think change is in the wind. Examples: Sarbanes-Oxley suggests that board members meet occasionally with key people below the senior management level. Nonprofit directors are becoming more aware of having social and professional interactions with staff to get to know them as people, because staff can be only two to three levels away from the board. While I have been taking both of these actions, as a director, in FP and NFP organizations, it will take while for it to become commonplace. This is why boards should encourage staff participation in board meetings whenever practical. Staff reports to the board work well for the small museum that I work for. I encourage staff to interact with board members but not to take direction from them, of course. I thoroughly agree. BUT the CEO should work closely with the staff people to make sure presentations are timer appropriate and well prepared. Staff often provide many more details than are necessary for time constrained board meeting times. Board and staff should also mingle at celebrations and other social occasions. Thanks for enhancing the discussions. What can be done when a Board seems to be in hibernation, while the CEO is bringing an organization down? Quietly have an attorney remind the board that they may incur some personal liabilities or reputation loss, if the CEO continues along the same path. A resignation of a productive staff or management person will help.